It was about a week ago that I finally settled onto the couch at about 9:30pm after a long day of mom-life. Imagine my surprise when, seconds later, a bat fluttered into the room to join us. What followed would best be described as a flurry of profanity-laced activity. We thought we had trapped the bat in the library, but then couldn’t find it. Surely it hadn’t escaped… it must just be hiding. So, off I went to bed and Lance stayed up to keep watch. 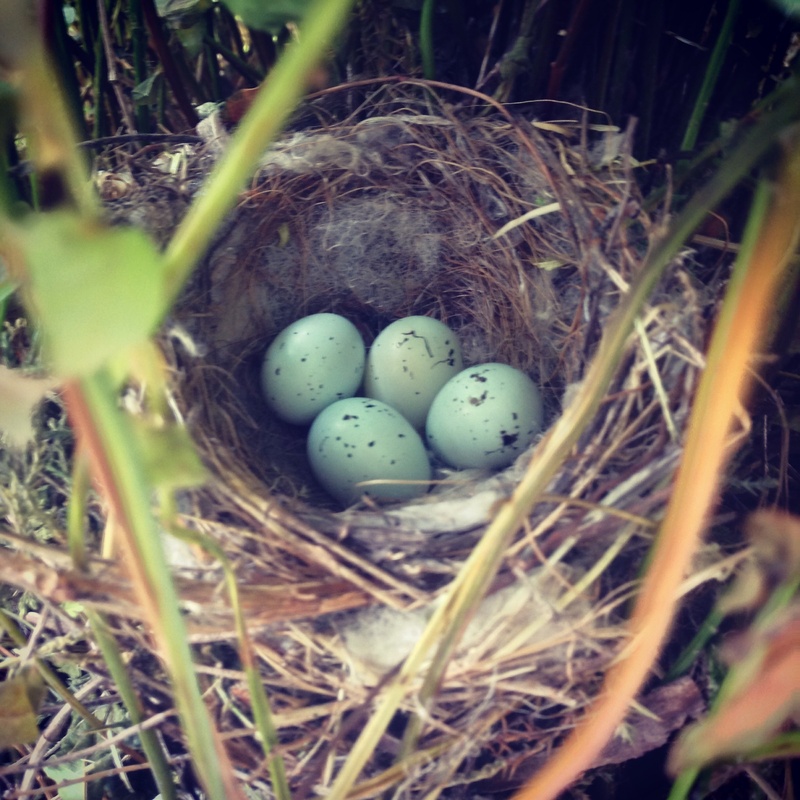 There is a cute little bird’s nest in one of the ferns hanging on my porch. A little mamma sparrow has chosen my Costco fern as a place to birth her family. 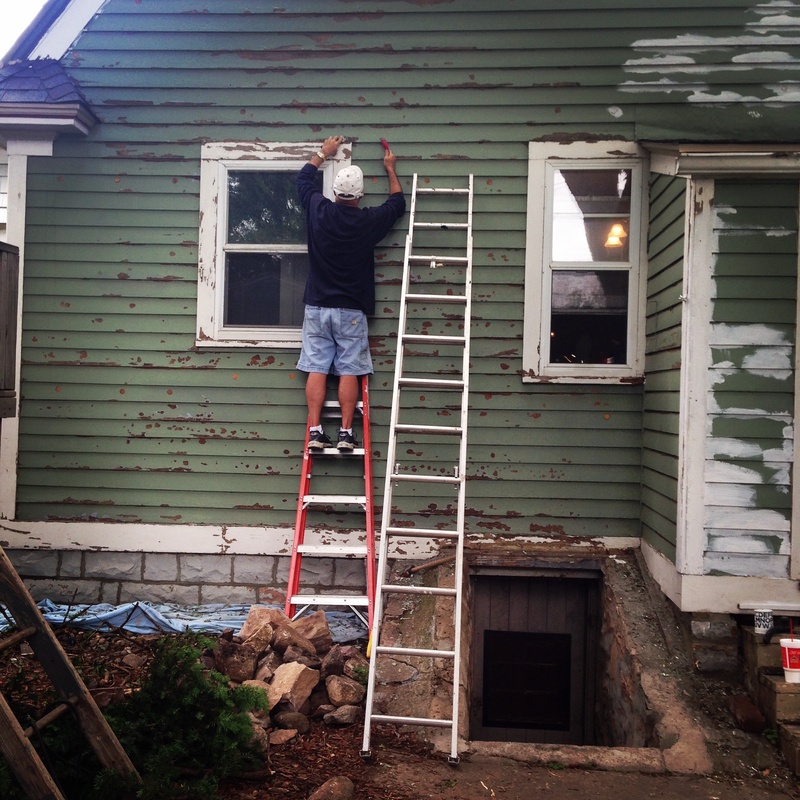 This week’s house projects involved tackling painting the rear of the house. We are close to getting it done (Dad and I). Lance’s weekend project was venting the dryer out of the attic, which is pretty boring, but very practical. I did not photograph his achievement. I’ll leave it to the imagination. 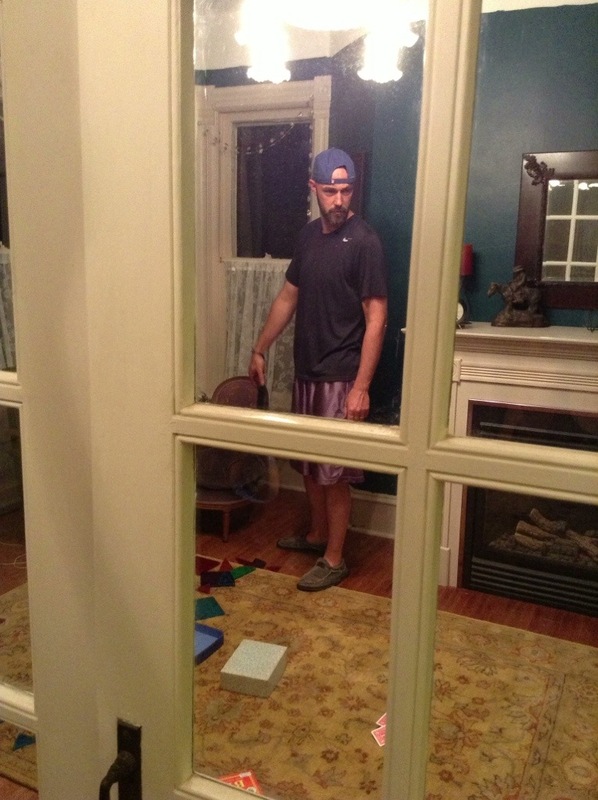 As we are closing in on the completion of our Victorian House Painting Adventure, I can say I am glad for many reasons that we are doing it all ourselves, but also can say that I DON’T want to do it again!!!!! It has been a beast of a project! Scraping, scraping and more scraping. See all of the round circles we scraped off? There were hundreds of little air bubbles under the paint- way more in this are of the house than others. I wonder why? I suspect it has to do with moisture. This is a very shady side of the house. 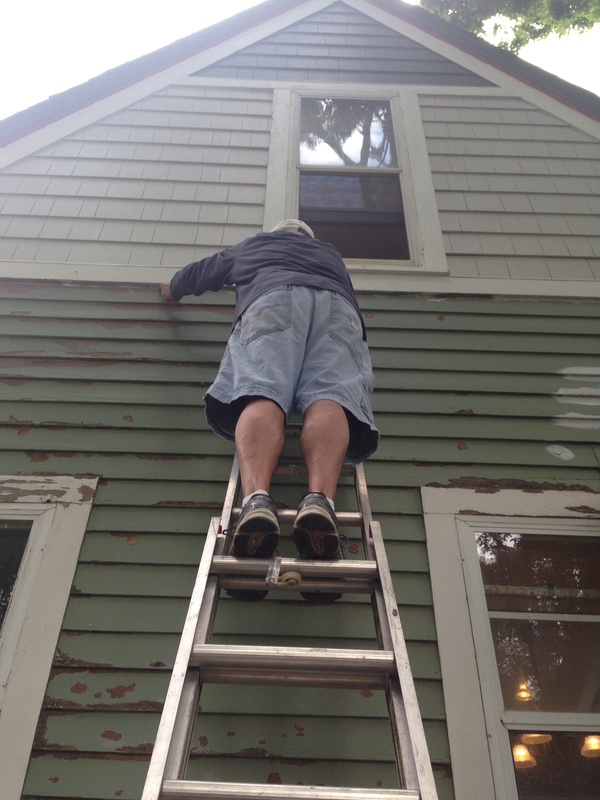 Good Old Dad up on the extension ladder. I held it for him and drank iced coffee. While painting the breezeway, I thought- “Hey- maybe I should paint the trim around the door orange. It will add a nice pop of color.” Clearly, I was under the influence of paint fumes and ibuprofen at this point. This was NOT a good idea. 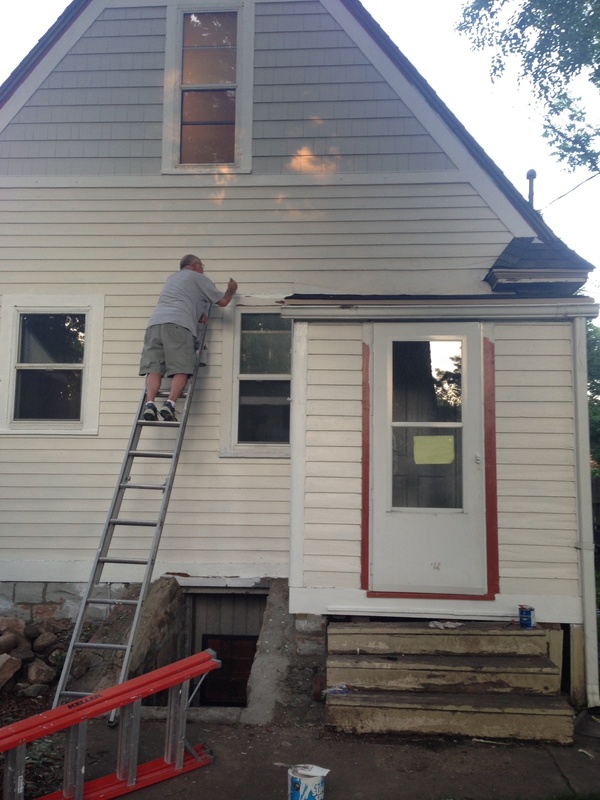 Tomorrow it will be repainted bright white like the rest of the trim. Oh Rachael! I had one flying around over my head at 2AM the weekend before we moved. I was home alone. KVS was on a fishing trip and Mom and Dad had the girls so I could get some serious packing done. I did trap it in the bedroom, went out to the garage to find a tennis racket just in case, and lured it through the crack under the bedroom door with the hall light. You would not believe how unsettling it was when it burst out from under the door lol! You gotta love old houses.